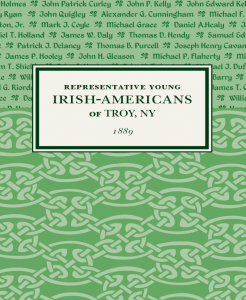 Young Irish-American men were among the most ambitious and civic-minded residents of Troy, New York, during the late 19th century. They came from all walks of life: business, the trades, law and government, public safety, and law enforcement. Some were lifelong residents of Troy; others were Irish immigrants who came to America full of hopes and dreams. In 1889 Edward H. Lisk published an illustrated biographical directory of these remarkable young men who contributed greatly to Troy's development.